Gourmandises-de-France is getting into the game with platters for your Super Bowl party! Btw, do they even play football in France? Anyway, the Upper East Side cafe is offering baguettes, fricasse and croissant sandwiches, borekas, salad platters, sushi platter, dessert sushi platters and more. You can even have parve desserts with your deli sandwiches. Now, who's the winner? Receive a complimentary 8” square cake choice of chocolate, black currant or tiramisu with orders over $180. That’s a $40 value. Click here for the Super Bowl packges. Call them at 212-724-7455 or email info@grill212.com. Options for 10 people (3 footer hero- $169) and 12 people (4 footer- $199), which includes wings, chicken fingers, pickles, and slaw. Extra items available for a la carte as well. Delivery available as well. Click here to view their menu. Click here to see their full menu packages. Delivery available throughout the tri-state area. They are offering a 64 piece sushi football platter for $49.95. Click here to view the platter. Feed 15 people with a selection of nachos, salsa, wings, taquitos, chicken sandwich platter and sauces for just $300! Email carlosandgabbysbrooklyn@yahoo.com to make your orders! This offer is good through Monday February 4th. 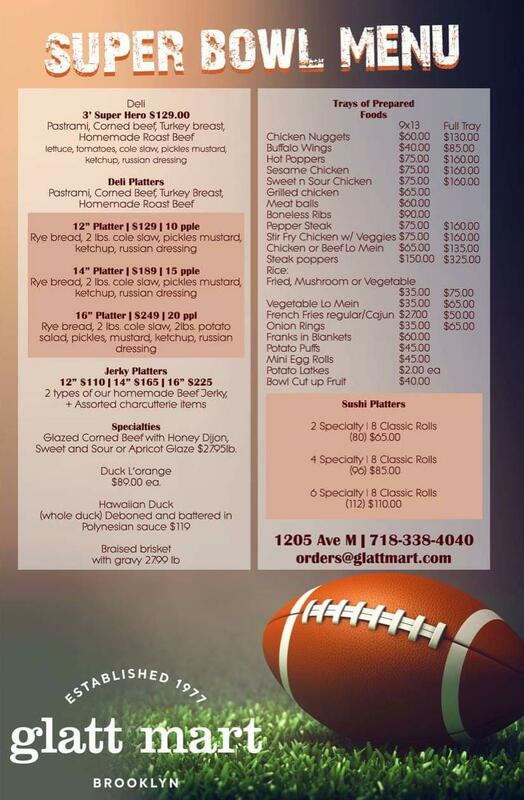 They are offering different Super Bowl party packages as well as an a la carte menu. Delivery and pickup are available. Reservations are required to watch the Super Bowl in the restaurant. Click here to view their menu. 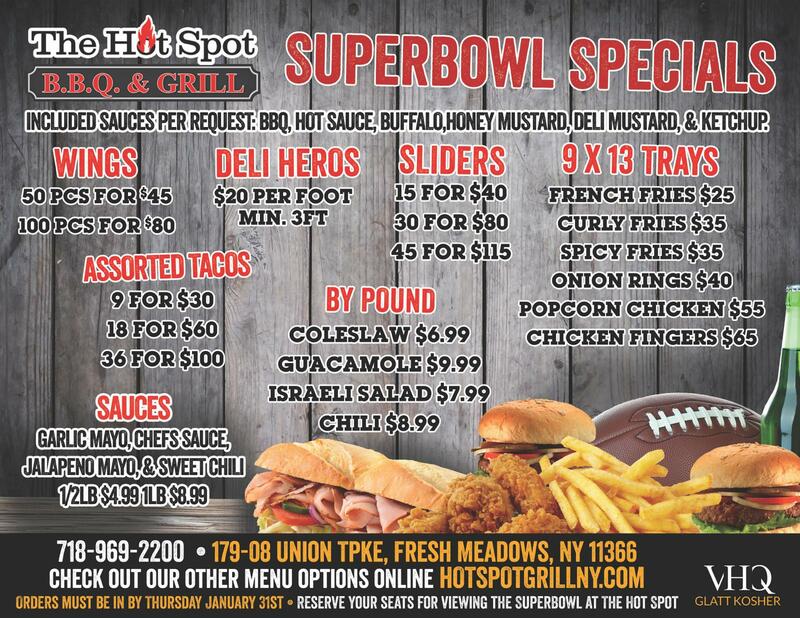 They're serving an exclusive Super Bowl Sunday take out menu to feed a crowd! Menu items include chicken wings, sandwiches, fries and more! Make your orders by Thursday night (347)-587-1068! Click here to see their menu. They are offering a variety of deli sandwich platters and chinese food by the tray, even sushi! Their prices range from $40-$90. Call in advance to make your order! Click here to view their menu. Offering different catering packs for 10 people- 60 people, ranging from $149- $999, including heroes, wings, and more! All orders must be placed in advance! Click here to view their menu. They will have a pop-up stationed at the Kingsway Jewish Center from 12:00 PM- 5:00 PM with all of your Super Bowl favorites! Quantities may be limited, so first come first serve! Click here to view their flyer. Offering different packages feeding 10 people up to 40 people. Click here to view their menu. A La Carte catering menu including items like wings, poppers, salads, sandwiches, beef jerky platters, and more! Click here to view their menu. Packages for $15 a person, $20 a person, and $30 a person. Click here to view their menu. Offering an a la carte catering menu including wings, heroes, and more! Click here to view their menu. Offering different catering packages feeing 10 people- 60 people ranging from $159- $1199. Includes Three-foot hero, wings, and more! Delivery and pickup available in New York, Teaneck, Deal, and Baltimore. Click here to view their menu. Many different packages available. Delivery available. Order by January 30th. Click here to view their menu. Choose from 3 different party packages that feed 4-6 people ($120), 10-12 people ($170), or 18-20 people ($300). A la Carte order is available as well. Click here to view their menu. They are offering packages that cater from 6 people to 25 people, as well as an a la carte menu. Click here to view their menu. Offering a Baguette Platter that feeds 5-8 people ($49.99) or 10-16 people ($99.99). All orders should be placed by Wednesday, January 30th. Pickup on Sunday. Click here to view their special menu. Sunday, February 3rd, starting at 6:00 PM all you can eat deluxe buffet! $23.95 for adults and $12.95 for kids ages 10 and under. Raffles at each quarter! Reserve your seats ASAP! They are also offering different catering takeout packages. Click here to view their menu. They are offering a Game Day Party Tray filled with of a variety of desserts! Prices are $25 for small and $50 for large. Baby Buns are $18 per dozen with frosting and topping, cookies are $10 dozen. Everything is customizable! Call to make your orders (561) 617-7227. * 20 Chicken Tenders with dipping sauce for $30. They are offering variety platters that feed 8-12 people for $150! With over a dozen items to choose from inclusing Chili, Nachos, Crispy Chicken and more! 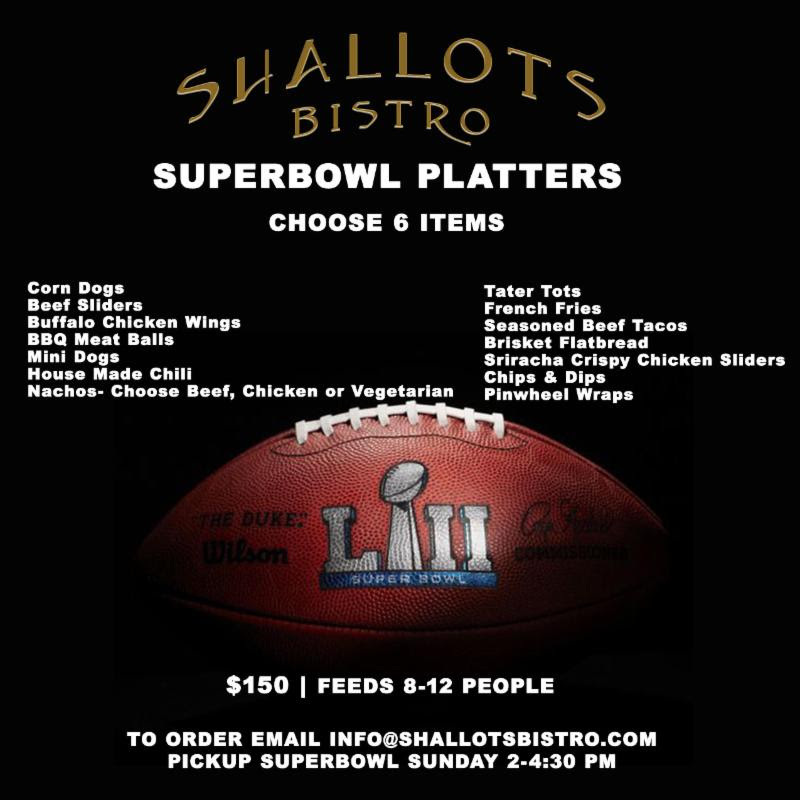 Call to make your order (847)-677-3463 or email to info@shallotsbistro.com. Click here to view their menu. 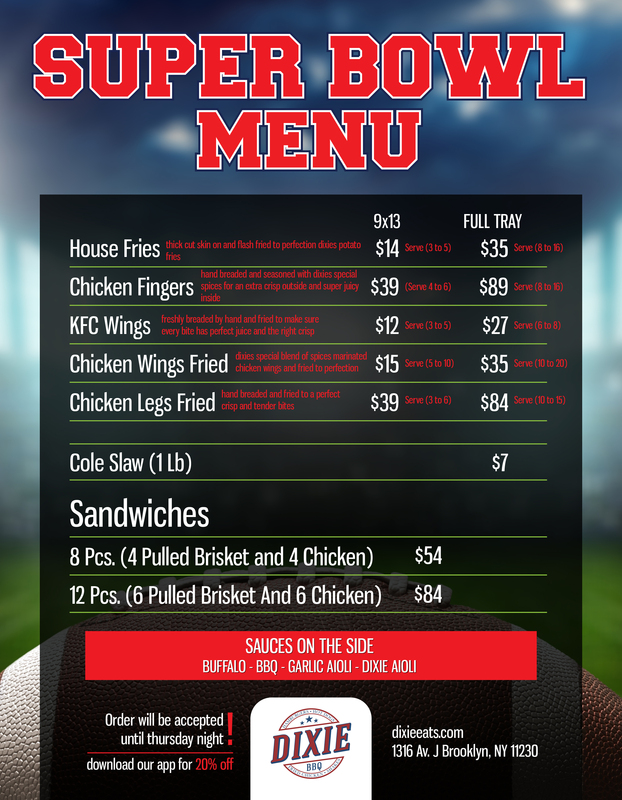 A La Carte Super Bowl catering menu. Order by January 30th. Click here to view their menu. They are offering two different packages, feeding 8-10 people or 10-12 people. A la Carte items are available as well as 9x13 pans that feed 8-10 people. Deadline to order is Wednesday, January 30th. Pickup only will be available on Sunday from 9:00 Am- 1:00 PM. Click here to view their menu. All you can eat buffet for just $50 per person! Enjoy the game on 13 big screen tvs, with table snacks, delicious buffet, halftime raffles and more! (*Price does not include tax, gratuity, or alcoholic beverages) Call (424)-302-00500 to reserve your spot! Exclusive Super Bowl Bash! Kickoff at 3:30 PM. All you can eat buffet, pre-sale $35, at the door $40. Limited space available. Make reservations at Pizzaworld@gmail.com / Phone: 323-653-2896. Click here to view their flyer. Offering 60 piece Sushi tray for $45 and a 58 piece combo tray of Maki, Sashimi, & Nigri. Click here to view their flyer.